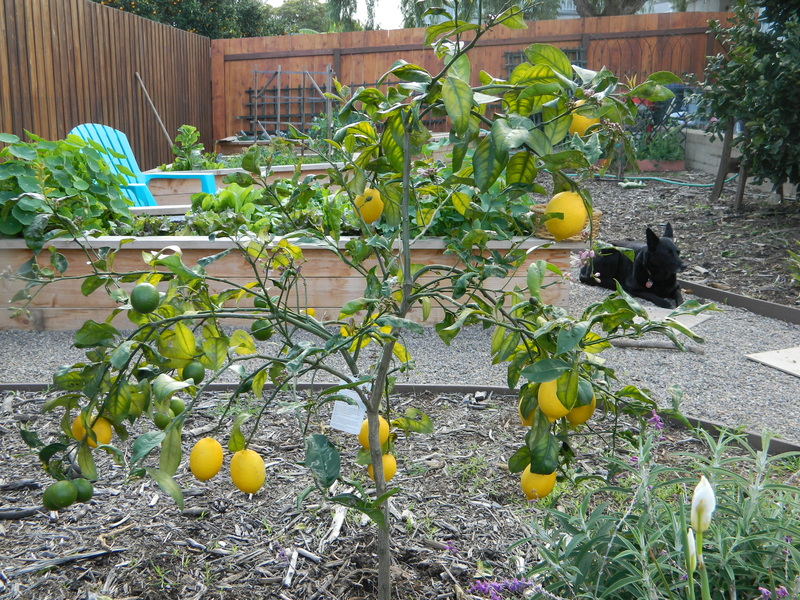 My baby Meyer Lemon planted last May. Star is her guardian! 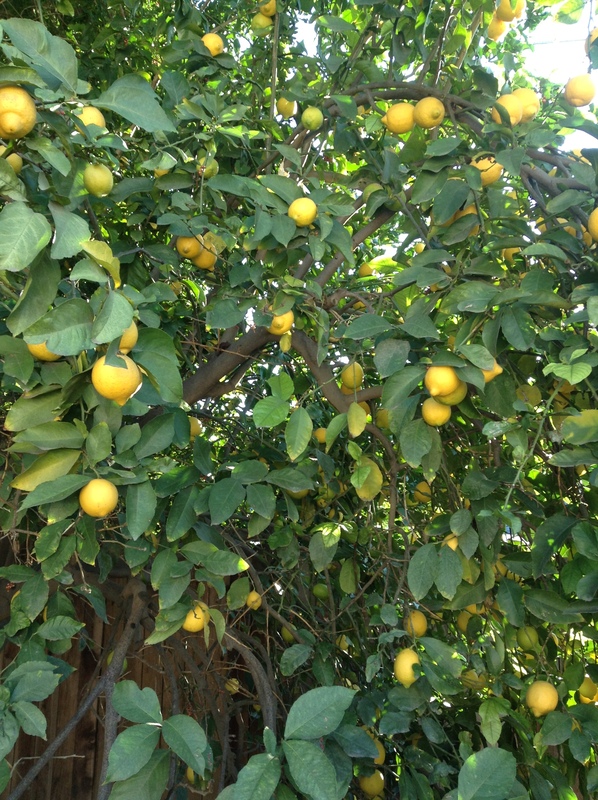 When I think of lemons, this folk tune often sings in my head, “Lemon tree very pretty, and the lemon flower is sweet, but the fruit of the poor lemon is impossible to eat.”* The author, of this song, Jose Carlos Burle, must never have tasted a Meyer lemon or he wouldn’t have written this song! My Mom’s Eureka tree – the Mother Lode! Lemons are so happy. Their cheery yellow color radiate love, a freshness and an eagerness to be utilized to the fullest. This means the zest AND the fruit. 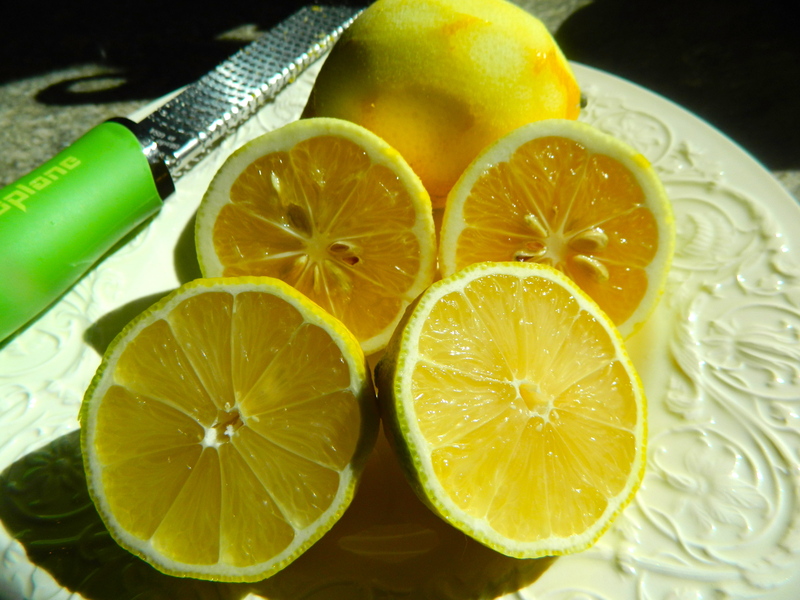 I cannot bear to juice a lemon without first removing its fragrant and flowery rind or zest. For me, this is the flavor, and, hence from which all delicious tartness is born. The Meyer lemon, less acid, more mandarin-scented and thinner-skinned, than its brighter yellow-colored cousins, makes it the perfect flavor for desserts. Its mellow tang shines in vinaigrettes and desserts. More orange-yellow colored Meyer is in the back and Eureka is in the forefront. Lemons are as dear to me as chocolate. Their flavor absolutely makes a bold and intense statement. So pucker up! Here are a few of my favorite ways to celebrate lemon season. I love the simplicity of this vinaigrette. The lemon gracefully enhances the lettuce leaves. Feel free to embellish it with capers, fresh herbs or olives. I tossed it with warm vegetable ravioli (butternut squash would be good) and was delighted with the taste. Also I can envision this dressing a niçoise salad, or any tuna salad. Feel free to adjust seasonings, amount of lemon juice or oil. Whisk the lemon juice and zest into the Dijon mustard. Slowly add the oil, whisking constantly until the vinaigrette fuses together. Add salt to taste. Adjust the amount of oil if it is too tangy for your taste. 2 Tbls. finely chopped parsley, basil, dill, mint, etc. Combine all ingredients. It is easiest accomplished with a food processor. Spoon butter onto a piece of plastic wrap or waxed paper. Shape the butter into a log and roll it up in the wrap. Freeze until firm. To use, slice off discs and use as added flavor on top of chicken or fish, vegetables, pasta or rice. I experimented with a few ways to “candy” lemon peel. I must say, it is not as easy as it sounds! My favorite way to create the peel I used for the tarts was to use very thin yellow-only julienne skins, simmered in a sugar syrup, then dipped in sugar. If you would like the recipe, I recommend the one from Epicurious at the bottom of this blog. In a food processor combine the flour, salt, and powdered sugar. Pulse until blended. Add the butter. Pulse again just until butter and flour form small peas. Mix cold water and egg yolk. Add to mixture. If you live in a dry climate or if the weather is very warm, you will probably need the extra 4th tablespoon of water. Form into a ball. Wrap in plastic wrap and refrigerate at least an hour to rest the dough. Roll dough to 1/4” thickness. 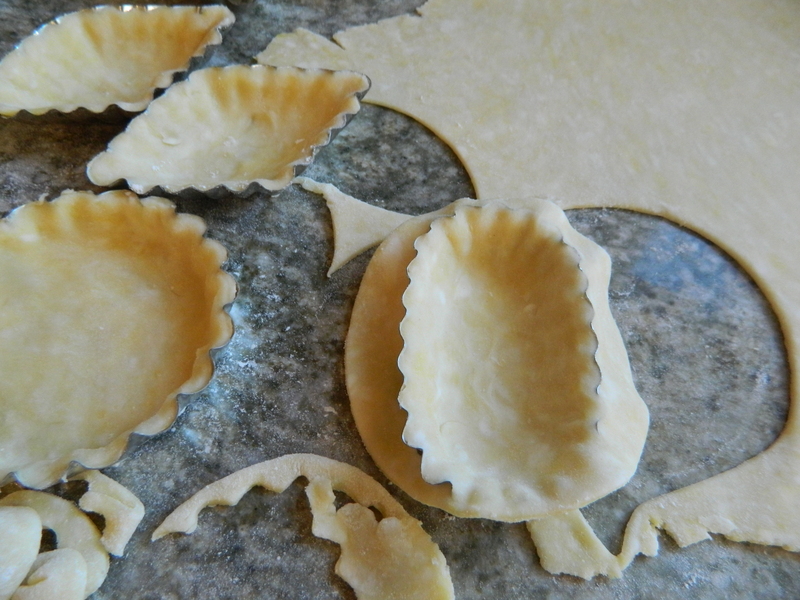 Depending upon the size of tart mold you are using cut out rounds of dough and place in molds. Refrigerate or freeze. I prefer these sweet little tart molds. They have such character! Mix together powdered sugar and lemon juice. Whisk in eggs. Stir in cooled clarified butter. Cook over low to medium heat for about 20 minutes or until lemon coats the back of a spoon. Pour into a bowl and cover with plastic wrap. Refrigerate. Zesty lemon just waiting to be savored. 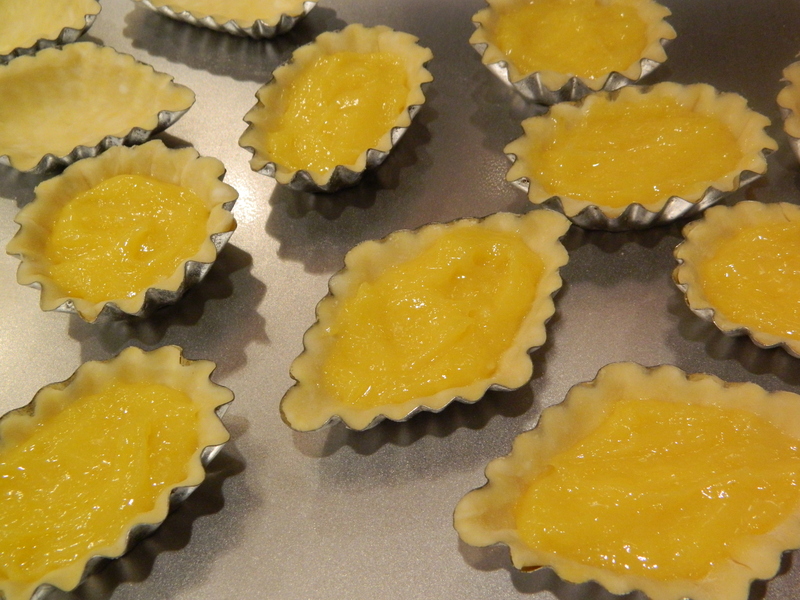 Carefully fill the cold tart shells about ¾ full with the lemon filling. Bake in a 375 degree oven for about 15-20 minutes or until the shells brown and the filling is bubbly. Le tart citron. Almost too pretty to eat! Let cool. Filling will “settle” meaning it ends up sinking a bit in the shell. Don’t worry. It will still taste fabulous. Either top with a candied lemon slice or pipe a bit of lemon mousse on top. For the mousse, I just add a little of the lemon crème to whipped cream and fold gently. Pipe mousse on top of the tart and garnish with slivered candied lemon peel, candied violets or mint leaves. 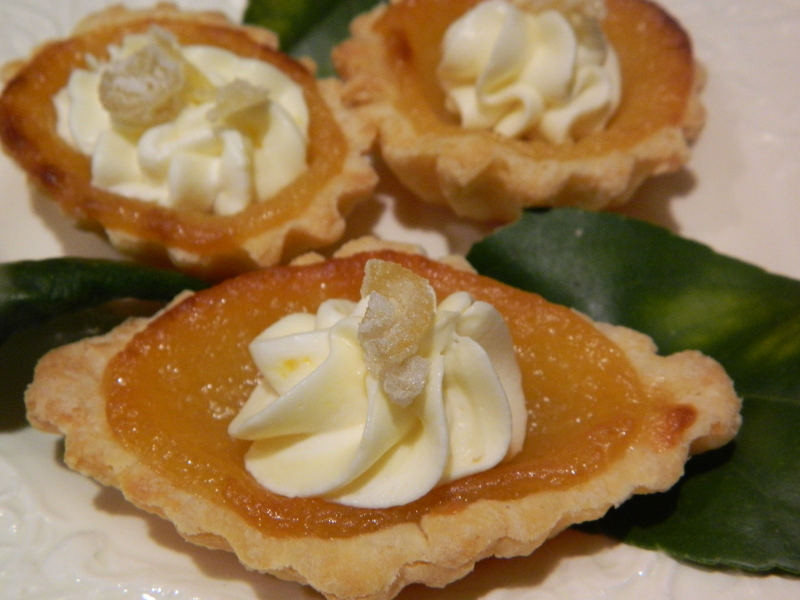 I love these tarts for a refreshing springtime dessert or any season for that matter. They are a delightful treat for baby or bridal showers or for an afternoon tea party. *The song compares love to a lemon tree. “Lemon Tree” is a folk song written by Will Holt in the 1960s. The tune is based on the Brazilian folk song Meu limão, meu limoeiro, arranged by José Carlos Burle in 1937 and made popular by Brazilian singer Wilson Simonal. 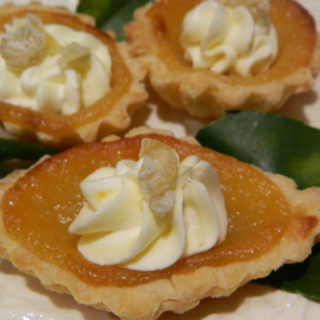 Now I am inspired to harvest lemons from my backyard tree…Must have a tea party and make luscious lemon tarts…thanks for the recipe..
Oh Mary – this is fabulous! I can’t wait to try these recipes. I do love reading your blog. Mary, thank you as always for a wonderful journey through your fabulous world of food. I am going to make the salad dressing soon. I do so look forward to receiving your entries and reading them. Keep up the good work. I wonder what is next? What a stunning entry! I have a whole new appreciation for lemons after reading your descriptions and viewing your beautiful photos. Even though we still have snow on the ground here in the Midwest, I feel like you’ve given me a way to invite spring ~ at least into my kitchen! Thank you!